Iran has deployed a fleet of warships to the Gulf of Aden, the republic’s naval commander has confirmed. The deployment follows U.S. cruise missile strikes on Yemeni positions thought to be under Houthi rebel control. 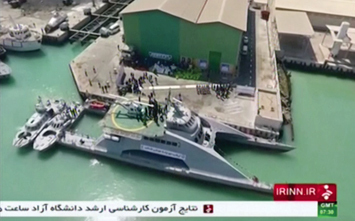 The Iranian Navy has sent the warships to international waters for a mission that includes entering the area off the southern coast of Yemen, Rear Admiral Habibollah Sayyari confirmed on Oct. 12. The area is among the world’s busiest maritime trade routes. Saudi Arabia, which has fought a long war with Yemen’s Houthi rebels, accuses Iran of supporting the group – a charge denied by Tehran. The U.S. military carried out “limited self-defense strikes” in Yemen on Oct. 13, in retaliation for recent attacks on an American naval destroyer, USS Mason, which has been operating north of the Bab Al-Mandab Strait. According to the Pentagon’s initial assessments, three “radar sites” in the Houthi rebel-controlled area of Yemen were destroyed in the attack. The attack on coastal targets was carried out by Tomahawk cruise missiles launched from the destroyer USS Nitze, NPR reported. The Houthis have denied carrying out the attack, however. A military source reportedly told Saba news agency—a media outlet run by the group—that the assault did not come from areas under its control. “These allegations are unfounded and the army as well popular forces have nothing to do with this action,” the source said. “The U.S. allegations just came in the context of creating false justifications to pave the way for Saudi-led coalition to escalate their… attacks against Yemen and to cover for crimes continually committed by the aggression coalition against the Yemeni people and to continue an all-out blockade,” the spokesman added.